It was not long ago that removing old, damaged flooring was quite messy. Your home was often closed off during the work, resulting in poor indoor air quality concerns and respiratory concerns for family and employees. It was a hassle. At American Flooring Removal, we grew tired of the mess, so we designed a dust-free tile removal service in Plano that is better suited to a modern household. Our experienced flooring technicians will remove your old flooring, opening your home to new possibilities. When the time comes for renovations or floor replacement in Plano, you need the very best. Anyone can come in with a hammer and tear our old tile flooring, but not everyone can complete the job with minimal mess or interference to your daily life. At American Flooring Removal, our team consists of licensed flooring experts who understand that quality flooring makes a difference. Did you know that quality flooring can increase the value of your home? It’s true. Dust, however, only causes a mess. Here at American Flooring Removal, we remove dust from the equation. The result is a clean, efficient flooring removal process that provides you with new opportunities. There are a number of reasons why choosing American Flooring Removal makes sense. For one, we offer affordable flooring removal services. Another profound reason to choose us over the competition is our attention to detail. You don’t provide dust-free tile removal without meeting exceptional standards of quality. Plano, a historic city in north Texas, is known for its various museums that are a testament to the 19th-century. Here, you can view old railroad cars, school rooms, farm tools, and more. All of this while we remove your old flooring! 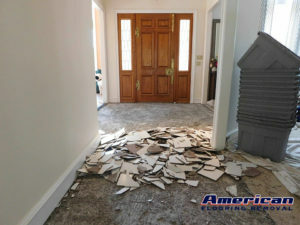 Schedule the best tile removal service in Plano, TX, with American Flooring Removal. Call 469-556-3936! We serve entire Plano, TX 75023, 75024, 75025, 75026, 75034, 75074, 75075, 75084, 75086, 75093, 75094, 75252. Great work! I’ve removed tile before, but I’ll never do it again. They removed all the tile and thin set, down to clean concrete, with no noticeable dust. Great crew!, they removed tile from 2 bathrooms and a kitchen. It would have taken me days! Spotless after they were done! Rarely, do I find contractors who treat my house like their own but my experience with American Flooring Removal was FIVE STAR! Ken's team is first class from quote to removing the last tile. These guys are courteous, well trained, efficient and pay attention to details. They left my house cleaner than when they arrived and that was after removing kitchen, dinning and laundry room tile. American Flooring Removal has earned my business in the future!